This month, the Czechoslovak-American Marionette Theater will perform “Golem,” which retells the Jewish legend about a golem created by a revered rabbi to defend the Prague ghetto from anti-Semitic attacks. 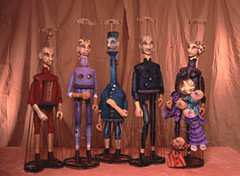 Vit Horejs, the director of the musical, which features eight performers handling puppets that are roughly four-foot tall, said that the story is a classic in the Czech Republic. He expected a big crowd for the performances, starting Nov. 17 at La MaMa theater on East Fourth Street. The production will be accompanied by live music performed by, among others, Frank London of the Klezmatics. In the story of golem, the Rabbi Loew ben Bezalel creates the clay figure to defend the Jews of Prague, but it becomes too powerful and begins terrorizing the city. In fact, the art has been used to poke fun at authority for ages. “Golem” at La MaMa’s Ellen Stewart Theater, 66 East Fourth Street between Second Avenue and Bowery, beginning November 17. Tickets $25, visit lamama.org or call (212) 475 -7710.